Early this morning, I woke up and decided to update some of my apps before committing to another freezing cold Melbourne morning. Lately, app developers have been pushing out new ideas more frequently and it's great. Trello, Duolingo, Harvest Time Tracking and Uber Eats are among my most frequently updated apps, as they always have a new feature or streamline an existing process to make it easier for me to do what I need to do. However, I noticed this morning that Gaiam had an update for one of my favourite health apps: Yoga Studio. I knew immediately that something big was about to change, which is commonplace for companies that rarely update, so I made sure to read the description before committing to anything. My hesitation paid off big time. 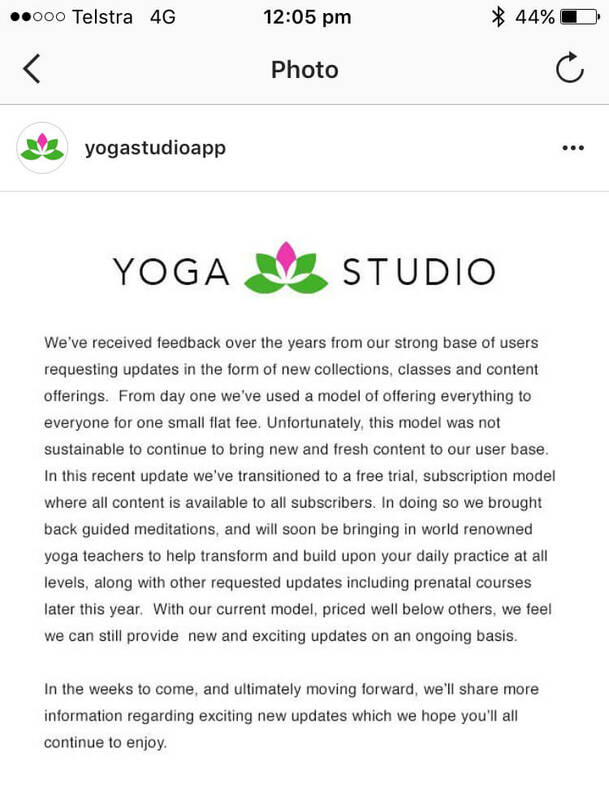 As it turns out, Gaiam have made the decision to ditch one-time payments for individual videos and classes, and instead, enforced a monthly subscription model to continue using the app. Now subscriptions themselves aren't uncommon practice these days, as they do work well when there's a perceivable value for the user and a consistent revenue stream for the company. (If you're a business that offers ongoing support, you'll empathise that one-off payments for continued use of your product or service isn't financially viable). So it's not what Gaiam did, it's how that's dropped them in a steaming pile of customer uproar. Gaiam's Yoga Studio App reviews, past and present. 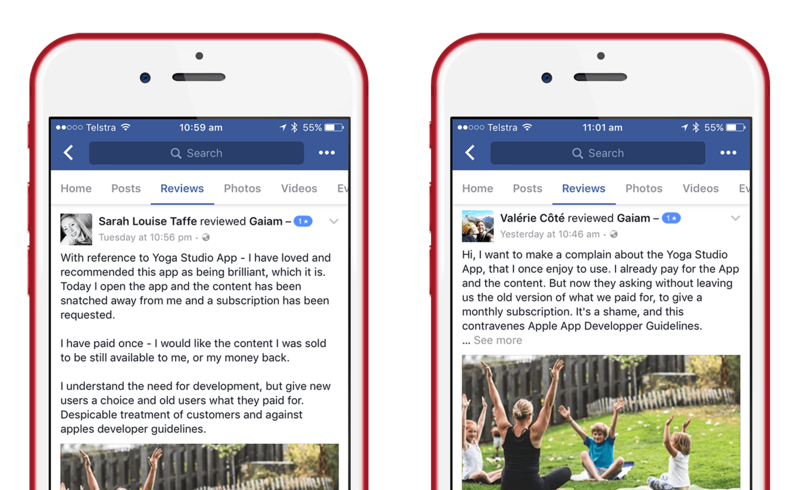 As you can see above, there's a very stark contrast between all previous updates and the new one – and customers have relentlessly vented their frustrations on all social platforms. So why was everyone so frustrated exactly? Many customers mentioned they'd have been more than happy to pay the new subscription fee, and fully understand why a business would do it, but Gaiam had made two huge mistakes. 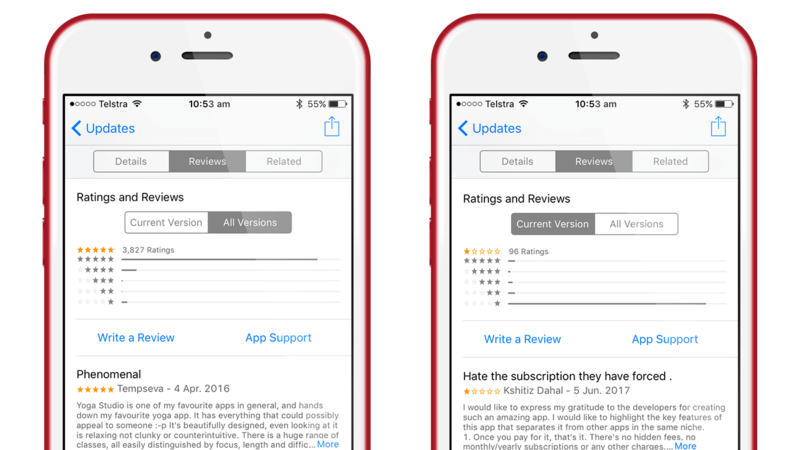 All previous payments users had made for individual content were now void, which contravenes App Store policy. I myself had dropped about $15 and to learn it was all going to be taken away from me after updating got me pretty miffed. Pretty scathing stuff, huh? Brutal even. So how could they have done things differently? Gaiam obviously received good and bad advice during this transitional change. Moving to a subscription model makes perfect business sense, but not appearing to care (or worse, know) about your customers, doesn't — and it's this lack of insight that has caused one of the most successful health apps to spectacularly fall from grace. Can they rectify the situation? Will they admit fault, own up and apologise to their customers? Or will it continue as a public relations and marketing nightmare for the company? If they do appeal to their audience with an apology and statement of intention to do right by them (and it's seen as genuine), it will certainly go a long way to righting any perceived wrongs in the minds of their user base. But, going off their most recent public statement, I'm not convinced they get it, yet. You don't need to be an online business or software dev company to learn from this example. 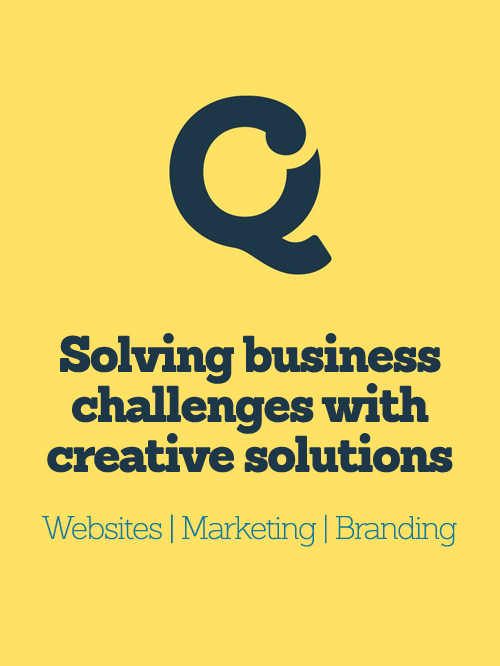 Effective User Experience will bring you business success. In fact, if you center your business around your customers, you will never obsolesce. Would I be happy using my own service or product? If the answer's no, make a change ...but make sure it's a well considered one. Sorry, none here yet — but I'm currently writing more!